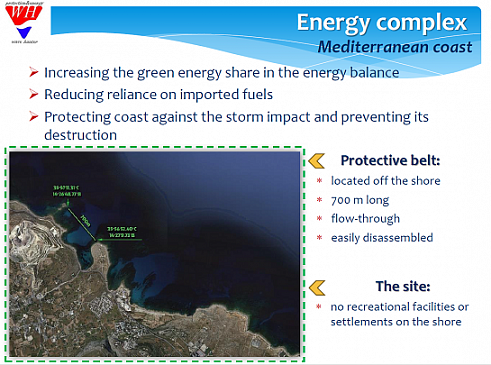 «Generate energy from the sea waves, we weaken them. 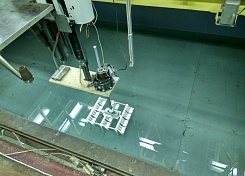 Rays of these machines, going ray by ray, could weaken them fully. 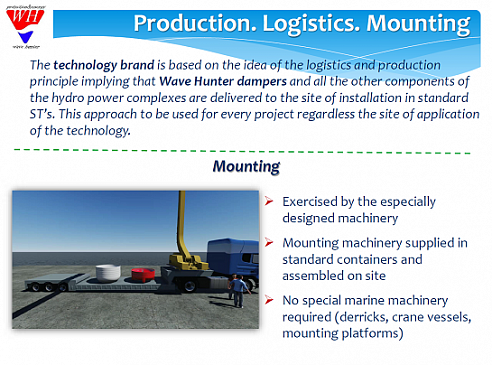 These machines will change us breakwaters and will make quite harbors, where they are necessary». 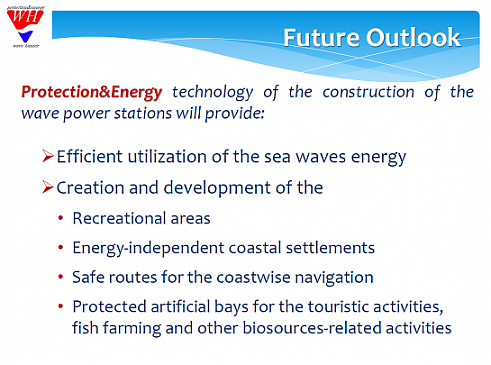 Description of Technology "Protection and Energy"
Sea waves have significant energy. 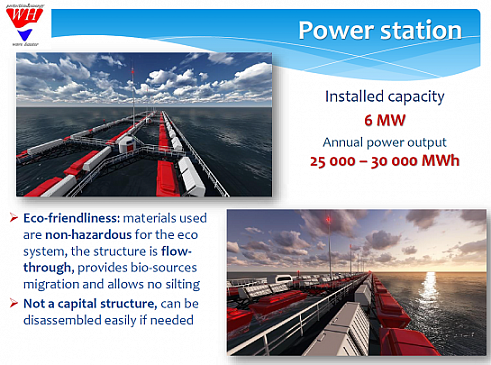 They are able to destroy the sea shore and the engineering structures built along the coasts. 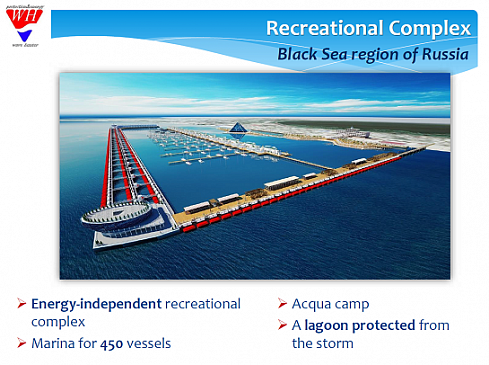 Inflict damage to other economic activities of the people. 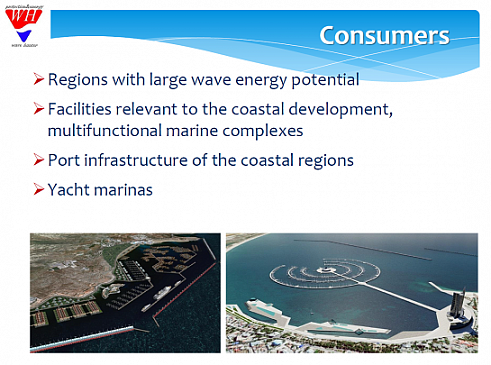 For this reason, people living in areas of coastal waters build various defensive structures - dams, sea walls, dams, etc. 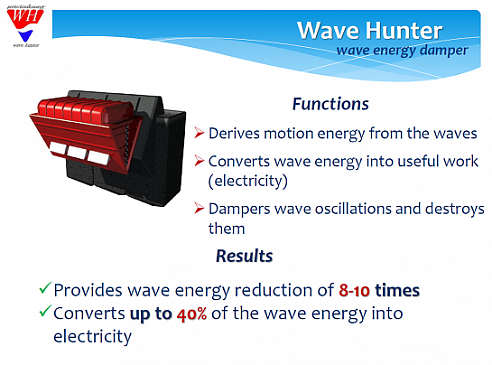 The energy of sea waves is constantly replenished by the sun's energy, so technically it is an inexhaustible source. 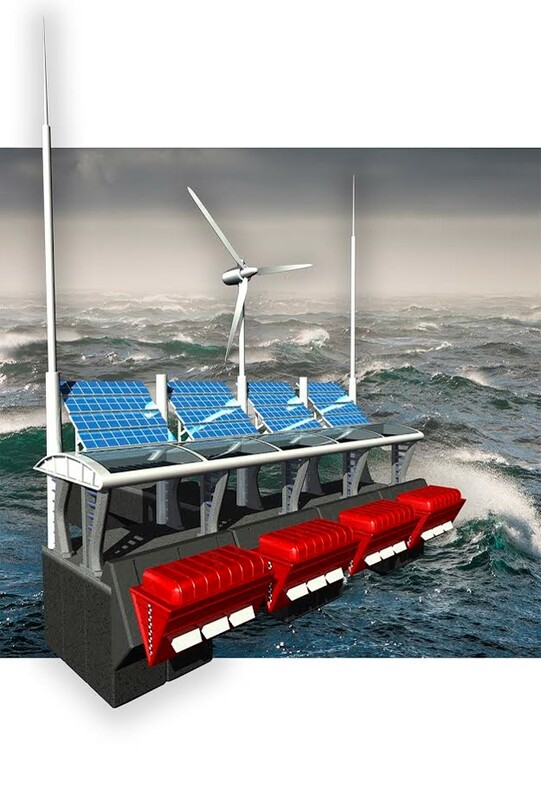 For this reason, many countries are actively being made to create designs that could convert the energy into useful work disturbances, in particular, into electricity. 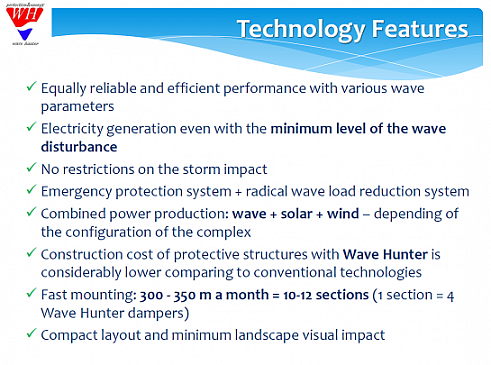 Practical use of the energy of sea waves, as well as the construction of protective coastal structures from the damaging effects of waves, require large capital investments. 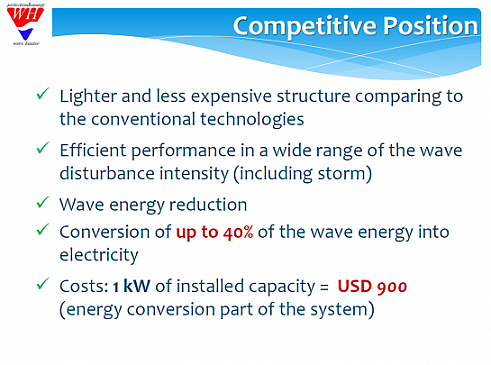 However, the economic efficiency of use of energy of sea waves and the creation of protective coastal structures can be significantly improved if the decision to combine the two problems. 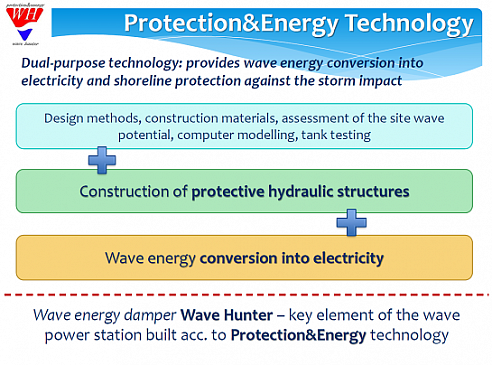 "Protection + Energy" - This approach is used in the technology developed by Hydro Enerdy Special Construction. 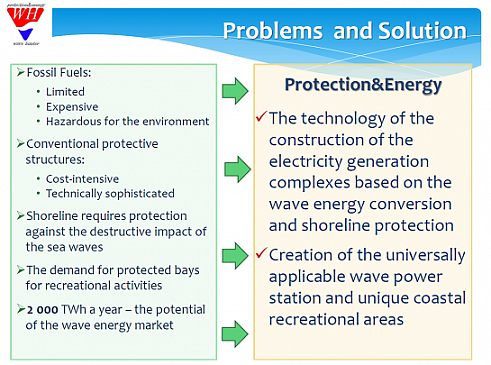 One solution to two problems - the protection of the coast and the conversion of wave energy into useful work, is achieved through the creation of marine protection wave energy complex, which is a set of engineering structures, located in the coastal area. 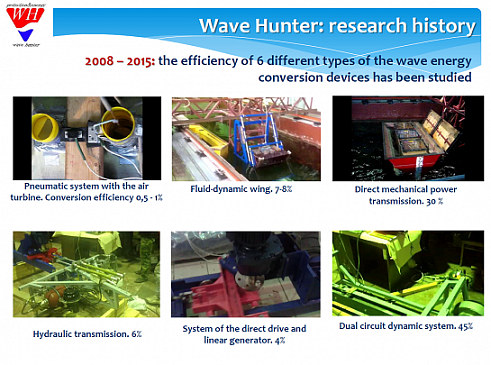 The damper Wave Hunter with installed power of 10 kW locates in Krylov State Researching Center on stand of Hesc Group. 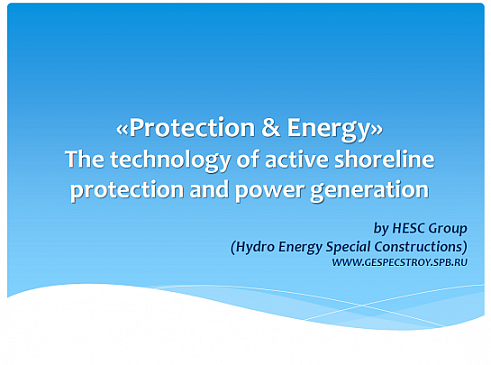 At this time Hesc group make scientific and researching works on creating hydro energy complex, includes generating electricity and protection of the coast line. 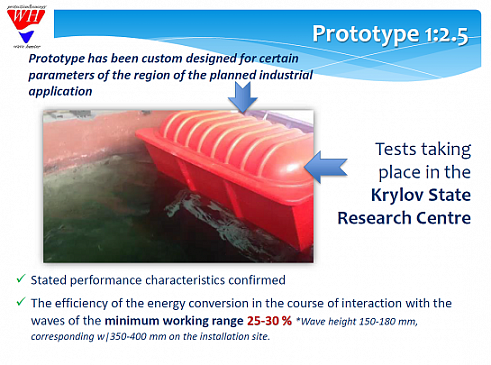 Author and Project manager – Egurnov Vladimir. 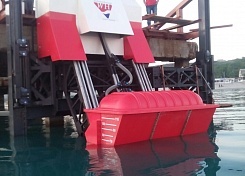 On the Black sea coast a working prototype of the wave power transformer "WAVE HUNTER" is installed, of the installed capacity 10 kW on 1:2.5 scale. 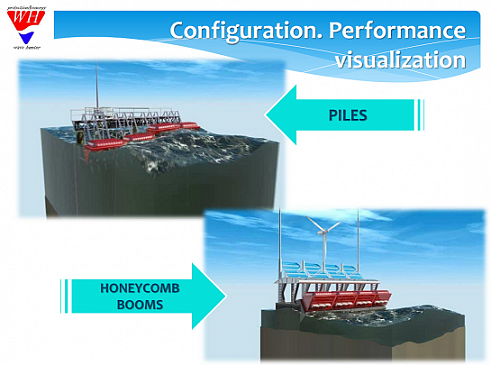 The scale was selected to simulate the action of the maximum storm on the structure. Innovation Promotion Fund Grant. The first stage is completed. The first stage is completed. 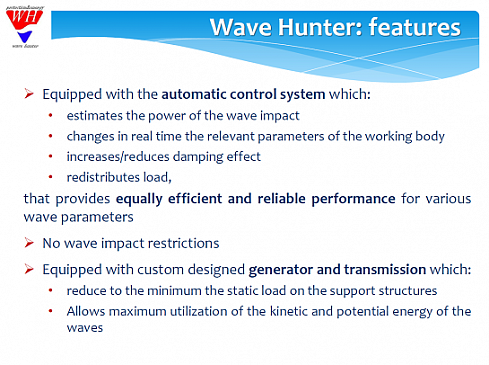 On December 22, 2016, there was signed a contract with the Federal State Funded Institution Innovation for Assistance to Small Innovative Enterprises in the Scientific and Technical Sphere (Promotion Fund Grant) for granting a grant to HESC Group to carry out work on the subject: "Development of guidelines for the design and calculation of building structures of the wave energy damper with a combination of the dynamic influence of wave energy and the moving of the landing stage with additional active resistance with the aim of including in the composition of norms effective documentation of the Russian Federation. " 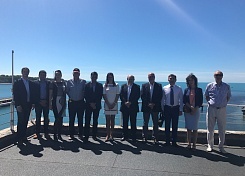 Within the framework of the International Exhibition "NEVA-2017" HESC Group a project in the field of clean energy "Coastal energy complex with functions of protecting the shoreline from storm impacts"
On May 26, representatives of the HESC Group and a delegation from Argentina visited the delegation of Argentina consisting of the Municipality of Necochea, the University of the Buenos Aires Provincial Center (UNICEN) in Gelendzhik, Blue Bay, where the management of HESC Group demonstrated a prototype of the wave energy Damper.